Present: Peter ZL2LF, Mike ZL2VM, Lee ZL2AL, Dave ZL2DW, Rob ZL2US, Stan ZL2ST, Jan ZL2CZE, Mike ZL2MY, Willy ZL2AGD, Sue ZL2DC, Wally ZL2MO, Bert ZL2OC, Shane ZL2PG and Karl ZL1TJ. Arising: Correction to QSL card listings. Emailed report from Lee regarding the installation and initial setting up of the club’s latest acquisition, an IBM SFF desktop computer, to be used for logging and digital modes etc. Finance: A switch to Powershop should result in a significant saving on our power account as we now pay (much) more per Kwh but pay zero line charges. Doing contests on cold winter nights may actually prove to be expensive. Wally referred to Break-In magazine’s OTC ( the real old timers club) section publicising Lee’s 60 years licenced operator certificate. A brief report by Mike ZL2MY on the recent 160m phone / 80m Trans Tasman VK-ZL contest, run from the clubrooms by ZL2AL and himself under the ZM4T callsign. Dave ZL2DW reported on ZL2GT working the contest from the Haumoana site with a more substantial crew and a huge crane to hold up the antennas. Write-up and photos may be found on the club’s website. Mike suggested that a future 160m antenna may need to be mounted differently and experimented with some more. Laurie mentioned the recent effort by himself, Lee, Mike ZL2MY and the undersigned to dismantle the antenna mast etc at SK Phil Moore’s (ZL2BLO) property and store this away at the club rooms for future re-erection. The job was done in about two hours with a constant drizzle keeping the workers cool. Again, some further info and picture was posted on the web notice board by web master Lee. The meeting closed at 7:45 pm and was followed by a presentation on how to be a competent and winning Contest Operator by Lee and Peter. The modern contest operator now has available a number of tools which do things like speeding up the exchange of data, reducing paperwork during and after the contest, giving operators instant indication how well things are going and reducing the possibility of errors. Logging software (some free) is available of the internet. Of all the programmes available N1MM is a favourite with most contesters as it is versatile and easy to operate. Contests range from world wide to Trans Taman to just local and the guys doing it get a regular adrenaline kick out of it and I am sure some form of addiction is involved. Of course to be a winner one has to be a good operator. A good OP is methodical, boring and has great listening skills says Lee. Various tactics and methods were explained and the talk was rounded off with five Pro Tips and seven ‘Never Do This’ items. Two complete contest stations had been set up within the clubrooms, in separate rooms, transmitting into dummy loads. Those present were invited to have a go at exchanging codes and logging the resulting data into the computer. The talk and practical demo were well prepared by Lee and Peter and fun was had by all present. A few years ago local amateur Phil Moore became a silent key. 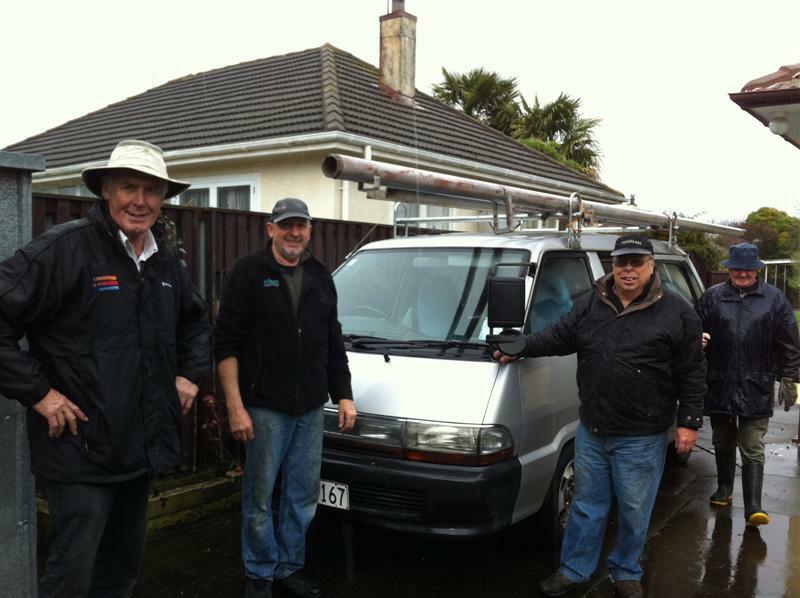 His son-in-law, Barry Wilson asked if the Napier Amateur Radio Club would like the mast. Yes was the answer and Sunday morning August 4th saw Laurie ZL2TC, Karl ZL1TJ, Michael ZL2MY, Lee ZL2AL and Barry assemble at Phil’s old home to remove the mast. It was a tiltover design about 11 metres in height and fastened to the side of the garage. The lower section 8m was 100mm diameter and the upper 3m section slightly less. The beam at the top of the mast looked like a G4ZU Mini-beam design but due to corrosion and it being a very old design with questionable gain, we decided to scrap it. It is hoped that the new Tri-bander which will desider on top of the mast at the club rooms will be a Hygain TH3 Mk Mk1. The team got to work with spanners and a small grinder with a cutoff wheel. A few hours later the mast was lowered and loaded on to Lee’s van and trundled off to the club rooms. Karl ZL1TJ, Barry Wilson, Laurie ZL2TC, Michael ZL2MY ready to roll with mast on the roof racks. Lee ZL2AL is behind the camera! The plan is to re-assemble the mast and erect it at the clubrooms with a Triband Yagi on top to add a new dimension to our club station. A great job guys. Thanks to all who braved the Sunday morning Hawke’s Bay drizzle.